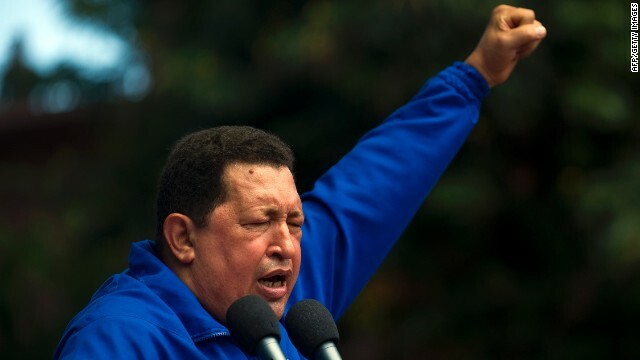 The late Venezuelan President Hugo Chavez is the subject of a "sacrilegious" new prayer. (CNN) - A member of the United Socialist Party of Venezuela and follower of Hugo Chavez is raising eyebrows for changing the words of the Lord's Prayer to honor the late president. Speaking during an event at the Third Congress of the United Socialist Party of Venezuela in Caracas on Monday, María Estrella Uribe read the changed prayer in front of hundreds of delegates and current President Nicolás Maduro. "Our Chávez who art in heaven, on Earth, in the sea and in us delegates," she read, "hallowed be thy name. Thy legacy come so that we can take it to people here and elsewhere." The delegate from the border state of Táchira kept on reading. "Give us today your light to guide us every day. Lead us not into the temptation of capitalism, but deliver us from oligarchy." Delegates cheered Uribe loudly, especially when she shouted "Viva Chávez!" at the end of her speech. Maduro raised no objections. But Uribe's actions have offended many Christians in the South American country, Catholics and Protestants alike. They say the words of a prayer found in the books of Matthew and Luke in the Bible should not be changed for political propaganda or any other purposes. Carlos Caripa, head pastor at the Saint Jude Thaddeus Chiquinquirá Church in Caracas, said the changed prayer was, at best, disrespectful. "It's an expression of people who had a deep affection for Hugo Chavez, who was our president, and that's how they're showing that love and affection. But that's not a feeling shared by all of our people. They're changing a prayer that is highly important to us, a prayer that begins by saying that our father is God," Caripa said. The Rev. José Piñero, vice president of the Evangelical Council of Venezuela, went further. "From a Christian perspective, we consider changing the words of the Lord's Prayer sacrilegious, an act of idolatry and desecration and a trivialization of the sacred," Piñero said. He said the evangelical leadership is deeply concerned about acts by loyal followers of Hugo Chavez who, Piñero said, are worshiping the late leader as if he were a divinity. "There was a movement that fortunately failed that wanted to establish a church and name Hugo Chavez a bishop," Piñero said. The cult of Hugo Chavez is not necessarily new. It started well before he died of cancer in March 2013. There is an altar to worship Chávez at Cuartel de la Montaña, the military barracks in Caracas where Chavez is buried. During the campaign that led to his election as Chavez's successor in April 2013, Maduro famously said Chávez appeared to him in the form of a little bird. An animated video published weeks after the president's death showed Chávez entering heaven and joining other deceased Latin American leaders, such as his revered independence hero, Simón Bolivar. The changed prayer also offended some Chavistas, such as Carmenchi Chavez (no relation), an attorney who said people should give Caesar what is Caesar's and God what's God's, paraphrasing Jesus' words in Matthew 22:21. "I'm Chavista," Chávez said, "but I believe that you can't mix politics with other things. You can have your own political persuasion, but you need to respect the beliefs people have been raised with." Osmary Hernandez contributed to this report.